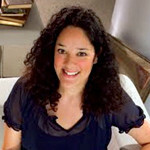 Mia Zamora, Ph.D. is Associate Professor of English, Director of the Kean University Writing Project, and Coordinator of the World Literature Program at Kean University in Union, NJ. Dr. Zamora is a faculty leader committed to encouraging lifelong reading and writing. Her passion for literature is rooted in her belief that reading and writing are essential to communication, learning, and citizenship. Zamora is a scholar of Electronic Literature (literary works that originate in a digital environment and require digital computation to read.) She is a digital humanist and she writes about how digital technologies are transforming education in the 21st century. Dr. Zamora is an educator who embraces #ConnectedLearning as she advocates for open networked education. She is currently launching a University Makerspace – a site for interdisciplinary campus collaboration and an outreach hub for students and teachers throughout the state. Mia Zamora has won the Kean University Presidential Excellence Award for Teaching, she is a Fulbright scholar, and she is a past President of the New Jersey College English Association. Her research interests in Comparative Literature, Postcolonial Literature, nationalism, and cultural studies are reflected in her book entitled Nation, Race, History in Asian American Literature: Re-membering the Body and her Postcolonial Studies Book Series. Dr. Zamora completed her M.A. and Ph.D. in Comparative Literature at the University of Wisconsin-Madison, where she was a fellow of the Center for Southeast Asian Studies.